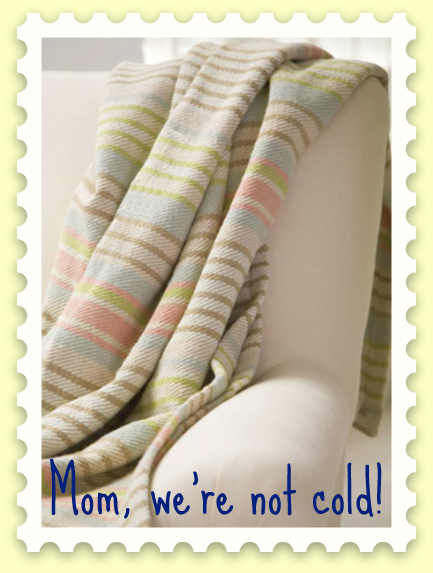 We all have them: mothers who think we are cold ALL. THE. TIME. Grandmothers/aunts/godmothers also can do this. Note to these women: we're just fine! Not cold. Actually, we're a little warm; turn down the heat! Anyway, when I came across this lovely Dash and Albert throw, I knew it would make a perfect Mother's Day gift. The colors are neutral, it's perfect for cuddling on the couch, or wrapping around you, and it's beautiful enough to be folded and hung over the couch. A perfect gift for the mom who loves to wrap you up and keep you warm (note: throw isn't too warm that when mother does said action, you won't overheat and get grumpy...come on, I know I'm not the only one who does that!). I love the slight dash of pink, it's not too feminine, nor too bold, it's the perfect May blanket!